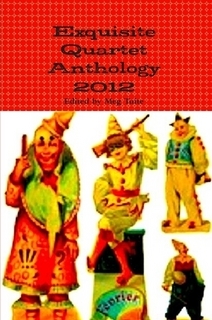 Exquisite Quartet Anthology 2012, edited by Meg Tuite, is an anthology of jointly written stories published monthly last year at Used Furniture Review. Among them is “Living Off the Man,” a story I co-wrote with Tuite, Aleathia Drehmer, and Misti Rainwater-Lites. There is a wealth of talent in this volume, and I’m honored to be a part. You are currently reading Exquisite Quartet Anthology 2012 at Neil Serven.